Finding the angle between two lines using a formula is the goal of this lesson. 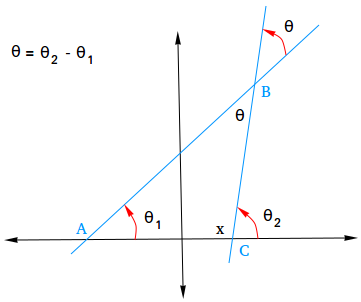 When two lines intersect in a plane, their intersection forms two pairs of opposite angles called vertical angles. 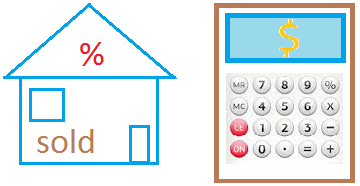 If the two lines are not perpendicular and have slopes m1 and m2, then you can use the following formula to find the angle between the two lines. First, notice that when two lines intersect, one of the two pairs is acute and the other pair is obtuse. The angle between two lines is defined as the smallest of these angles or the acute angle denoted by θ. We are going to use the inclinations of the two lines to find the angle between the two lines. You may need to review the lesson about inclination of line. Using triangle ABC, we know that the sum of the angles in that tiangle is equal to 180 degrees. Furthermore, x + θ2 = 180 (equation 2) since x and θ2 form a straight line. Replace 180 with x + θ2 in equation 1. Now, you can use the formula for the tangent of the difference of two angles. Notice the use of the absolute value to ensure that tan θ is equal to a positive number. 1) Find the angle between the following two lines. Put 3x - 2y = 4 into slope-intercept form so you can clearly identify the slope. Put x + 4y = 1 into slope-intercept form so you can clearly identify the slope. The slopes are 3/2 and -1/4 or 1.5 and -0.25. It does not matter which one is m1 or m2. You will get the same answer. 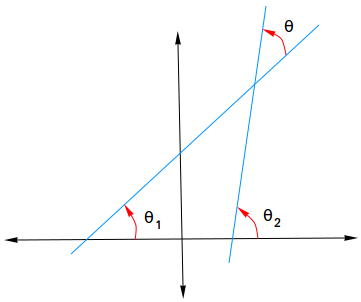 2) Find the angle between the following two lines. Put x - 4y + 4 = 0 into slope-intercept form so you can clearly identify the slope. Put 3x - 4y - 8 = 0 into slope-intercept form so you can clearly identify the slope. The slopes are 3/4 and 1/4 or 0.75 and 0.25. Again, it does not matter which one is m1 or m2. You will get the same answer.